Hero Honda was a very successful company formed by a joint venture between two major bike manufacturers. They launched and sold some of the best-selling bikes in India. After splitting with Honda two years back, Hero MotoCorp has been on a roll with new product launches set to take the market by storm. The company has plans to showcase 12 new products at the 2014 Auto Expo out of which 5 new products were already unveiled by the manufacturer last week which include – HX250R 250cc bike, RNT 150cc diesel scooter and Dash 110cc scooter. Following the HX250R, Hero motocorp will unveil a superbike. Yes its a superbike codenamed as Hastur. The hastur bike will be a 600cc model competing against the likes of KTM duke 690. 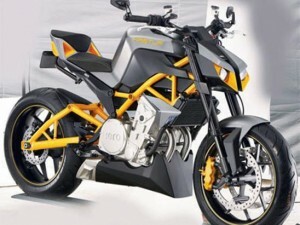 Hero Hastur 600cc is being jointly developed with its Erik Buell Racing. Its important to remember, Hero picked up majority stake after its split with Honda and ever since the duo has been working together for various bikes.